It scares me to think about the number of toxins our kids are exposed to every single day! Our kids are growing in a relatively toxic environment than we did. There was a recent study that found out that many kids urine tested positive for BPA. 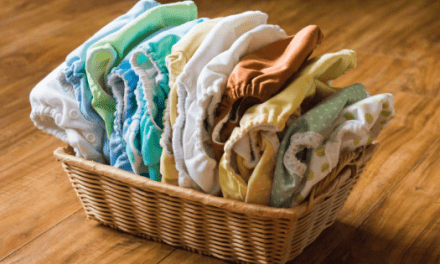 While it is essential to reduce chemical exposure by choosing non-toxic products, it is also equally important to help their little bodies eliminate toxins from time to time. What is a Detox Bath? Detox baths are an easy effective and natural way to help get rid of the toxic accumulation in the body. Detox bath soaks are very simple and can be drawn using Epsom salts, Baking soda, Essential oils, some recipes even calls for clay, essential oils or ginger. While there is less scientific research done to study the results, there is plenty of anecdotal evidence to believe that detox baths have great results in detoxification. The key elements in detox bath are Epsom salts which pull away toxins from the body while the skin absorbs essential minerals like magnesium. Detox bath has various benefits for kids of all age. While detox baths can provide great relief when your babies are sick, you can give them a detox bath regularly to boost their immune system. 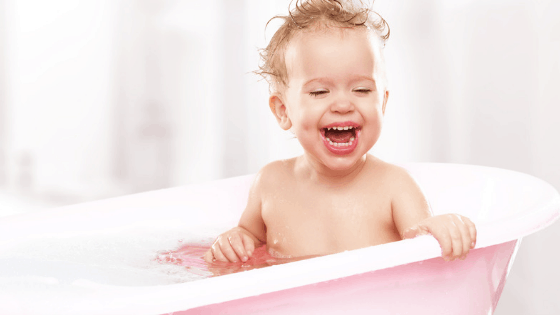 A warm detox bath can provide congestion relief when our little ones are down with a cold. Diffusing essential oils like Lemon oil during the bath can also help fight cold. If your kids are complaining about sore muscles or body-ache due to a cold or flu, a detox bath can be very relaxing. Magnesium in the Epsom salts, which is the main ingredient in a detox bath, is known to increase the body’s ability to fight infection. Detox baths are an effective topical treatment to repair the damage on eczema-prone skin. Kids who suffer from eczema have extremely dry skin and soaking in the detox bath can restore the ph level of the skin. Make sure to pat dry the skin and moisturize after the bath to lock the moisture in the skin. We already do oatmeal baths to calm my son’s eczema. When his eczema peaks, I would alternate between oatmeal bath and a detox bath. I am so happy to report that his skin is not breaking out as much as it used to. Vaccines contain heavy metals like aluminium,Monosodium glutamate and Thimerosal (Source) that can build up on our babies body systems. Detox baths contain negatively charged ions that help flush out heavy metals and other toxins away from the body. Babies and toddlers need an ample amount to sleep for optimal brain development. If you think your baby is having irregular or disturbed sleep patterns, I highly recommend giving them a Detox Bath. I have found that Lavender infused Bath salts did a fantastic job in settling my kids down before bedtime. Magnesium deficiency in kids can make them cranky, weak and stressed. Detox bath can beat stress by increasing GABA, the neuro-transmitter that boosts mood and have a calming effect on the nervous system. Many moms have found Detox Baths have helped their kids with Autism or ADHD lower their anxiety levels. Constipation along with disturbed sleep is a sure sign of Magnesium deficiency in kids. Magnesium supplements are recommended when constipation is a recurring problem. You can also try detox baths to get things moving. Detox baths does a great job in promoting the overall health of your child by boosting the body’s immune mechanisms. I have noticed that my kids fall sick less after I started giving them detox baths. DISCLOSURE: This post contains affiliate links. For complete details, please read my affiliate disclosure page. You can make homemade detox baths with simple ingredients listed below. The main ingredient that you need for a detox bath is Epsom salt. You can only take an Epsom Salt Bath if you want, but adding other ingredients can have its own benefits. Epsom Salt is not your regular table salt, it is Magnesium Sulfate. When dissolved in water, it separates into Magnesium and Sulfate. Both, magnesium and sulfate are absorbed into the body through the skin. Improves body’s immunity to fight microbes. Provides relief for sore muscles and growing pains. Improves the quality of sleep. Lower the level of stress and help kids calm down. Great for atopic skin conditions like Eczema and Psoriasis. Baking Soda is a staple in almost every household. When added to bath water, baking soda reacts with the chlorine in the water and neutralizes it. Baking Soda is a great addition to any detox bath, it will make sure that chlorine is not absorbed through your baby’s skin. I have used diluted raw Apple Cider vinegar topically and saw great results on my son’s eczema prone skin. ACV is amazing to add to a detox bath because of its anti-bacterial and anti-fungal properties. Ginger helps in getting rid of the toxins and promote blood circulation by increasing the body temperature. Taking a ginger bath makes you sweat which helps to eliminate toxins from our system. You can either add freshly grated ginger or ginger powder to the bath. I would hesitate adding ginger for babies, some babies might have skin irritations. Ginger baths work great when battling against cold and flu. When trying this with toddlers and kids, I would test it out by adding a teaspoon of ginger powder to a bath. I always recommend using essential oils with babies and toddlers with utmost caution. Many essential oils are not advised to use with kids under 2 years old. I always diffuse oils in the bathroom while they are taking a bath instead of adding the oil directly to the bath water. Some of the best essential oils that are safe to use for kids over two are Lemon Grass, Citrus, Tangerine and Lavender. Bentonite Clay is another mighty detox agent that has been used in many ancient cultures to help the body flush out toxins from our system. Bentonite clay is made of aged volcanic ash that is rich in minerals like silica, calcium, potassium, magnesium, and iron. When dissolved in water, bentonite clay releases negatively charged ions that attract that positively charged heavy metals like aluminum, lead, and mercury. Bentonite clay is also very useful to remove poisons, treat cuts, scrapes and other skin problems. When using Bentonite Clay, make sure that they don’t come in contact with any metals. You can use plastic or glass to dilute clay to add to the bath. Also, make sure that you buy high-quality Bentonite clay as they can be contaminated with lead. This recipe is specially for toddlers, you can tweak the recipe according to the age of your baby. Bentonite Clay : 1 – 2 table spoons. Step 1: Fill the bath tub with enough hot water. The water needs to be warm to open up pores. At the same time, you don’t want it to be too hot to burn your baby’s skin. Step 2: Add the ingredients to the bath tub. Add Epsom salts, baking soda and bentonite clay. Step 3: Give a good swirl with your hands to mix all the ingredients to dissolve. Check the water temperature and put your kids in. Step 4: Add bath toys and let them soak in the detox bath for a good 15 – 20 minutes. Step 5: After 20 minutes, give them a good rinse. You don’t want to add shampoo or a soap. Step 6: Pat then dry and make sure to moisturize the skin. You can apply organic virgin coconut oil or a non toxic body lotion to seal the moisture in the skin. Step 7: Detox baths can be dehydrating. Give your kids plenty of water to drink after the bath. If you are using this recipe on a younger baby, less than an year old, you can cut the measurements in half. 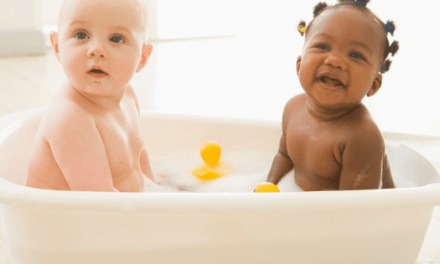 If you can using a baby bath tub , I recommend using very small quantities to start with, observe how your baby reacts and then continue accordingly. Detox baths made of Epsom salt and Baking Soda are generally safe for babies and toddlers. Some kids may have minor side effects. Detox baths can leave your kids feeling light headed and dizzy. They may also feel thirsty as detox baths are dehydrating. To avoid this, give your kids enough water before and after the bath. Some kids may be sensitive to Epsom salts. In such cases, you can skip Epsom salts and add Dead Sea salts instead. How often do you do detox bath? I would say once a week. You can even do it daily if your kids are down with a cold or flu.Making detox baths are regular routine will help minimize the frequency of sickness in children. Detox baths are powerful, effective way to eliminate toxins and boost children’s immunity. I have seen a lot of difference by giving my kids detox bath regularly. Even just adding Epsom salts to the bath work wonders. But, I highly recommend adding baking soda and Betonite Clay to reap additional health benefits. Have you tried Detox bath? Did you see a difference? 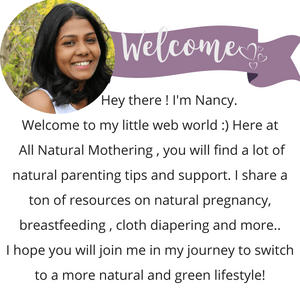 Next5 Organic Nursing Pillows For Every Breastfeeding Mama! Umbilical Cord Care : Natural Remedies for Faster Healing! The Best Natural Diaper Cream for your Baby’s Bum!